Sarah was born at Narangi on the Monkittee River not far from Braidwood on the 10 October 1886 (BMD, NSW, Ref 016661). Her grandmother, Harriett Shepherd was present and assisted at the birth. Her father was recorded as a farmer on her birth certificate and given the location he was probably a tenant farmer at Monkittee. There would have been little rest for her mother following the birth, with two small children, Alexander, four years old and sister, Mabel two years of age to look after as well as the usual domestic chores and those required for self sufficiency such as tending poultry, growing vegetables, raising chooks and keeping either a cow or goat for milking. When Sarah was almost three years old, her sister Harriet was born on 19 August 1889 (BMD, NSW, Ref 16562), by then her family had moved to Durran Durra, about 15 kilometres north of Braidwood. It would appear that her father was still a tenant farmer but was now renting land owned by the Ryrie family. This was a harsh life, and her father would have frequently been away from home, seeking work to supplement their income from the farm. Was I to touch my hat to him? – was I his bloomin’ dog? Whether this was the case for Charles and his family it is not possible to say but by 1891 the census records show the family were no longer tenant farmers and were living at Lascalle Street, Braidwood. 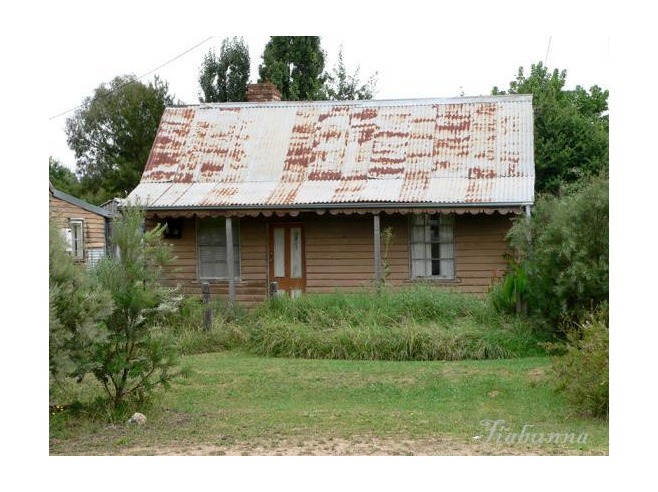 This is where Sarah’s sister and last sibling, Ruby, was born on 6 July 1893 (BMD, NSW, Ref 7993). Sarah was 7 years old at the time. On the occasion of the newspaper’s report special prizes were awarded to the girls for sewing, for the student who sold the highest number of tickets for the school concert and to the boys for rifle shooting. There were 249 children enrolled at the school and the average attendance was recorded as 180. The school day commenced with the teacher inspecting every child’s hands prior to entering the classroom to ensure that they were clean enough to begin their schoolwork. Sarah, along with her brother and sisters would have been up early and had a range of chores to do before walking to school. Although they now lived in the town the children would have been expected to help with housework and tending the vegetable garden, fruit trees, and chooks, hence the reason the teachers did hand inspection before school started. Sarah enjoyed school and was considered bright. By the time she left school Sarah could read and write, and had undoubtedly mastered a range of domestic skills, such as sewing, which were the focus of education for a young working class girl. When Sarah was 10 years old her father succumbed to the harsh working life he had led dying of pneumonia on 9 June 1897. Sarah would have watched her father struggling to support the family, often away for long periods of time as a carrier and finally returning home exhausted and ill. With the death of her father, her family was left in poverty, struggling to make ends meet and often dependant on charity and the help of their extended family. The burden to support the family would have rested on the shoulders of her two brothers, Zenas, who was 20 years old, and Alexander who was only 15 years old. The family seemed to be beset by one disaster after another with the Braidwood Dispatch and Mining Journal, dated 9 September 1903 covering the outbreak of typhoid in the Braidwood region reported that a daughter of Mr C Shepherd had also become a victim of the disease, it did not specify the name of the child. ‘I was engaged by a registry office keeper as a cook and was informed that it was a nice easy place, with only four in the family and nothing to do but cooking. This is what I had to do. ‘Get up at half-past 5 in the morning, sweep the verandah, scrub the passage and bathroom, clean and black lead the scraper. beat the door mats, feed the fowls, milk a cow, clean four pairs of boots and above all things for a cook to do, scrub the water closet. Then I had to cook breakfast for seven in the family. ‘After breakfast, which was always cold when I got it, I had to wash up all the things and help the girl, called the housemaid, to make the beds and clean the house. Then I had to cook the lunch, which had to be on the table at 1 o’clock sharp, or else look out for a row. ‘After lunch I was required to wash up and get the dinner ready, which was on the table by 7 o’clock and was as follows – Two joints, soup or fish, three sorts of vegetables and puddings and pies; sometimes both. At 10 o’clock coffee had to be made and by the time the cups and saucers were washed up it was 11 o’clock. Being ‘in service’ was regarded as a lower station in life than that of a shop-girl who occupied a better social position. Along with the family urging that “she had to make her own way in the world”, it may have been sufficient reason for Sarah to leave her home and family to seek employment in Sydney when she was 17 years old. Records show that she was employed in a draper’s shop but no other details are available. While shop assistants did not have to engage in any arduous physical labour, their hours were exceptionally long. On weekdays they had to work from 9am to 9pm, with hours extended until 11pm on Saturday but at least she had Sundays off unlike domestic servants who appeared to be at the constant beck and call of their employer. Two years after she left home disaster again struck the family again. 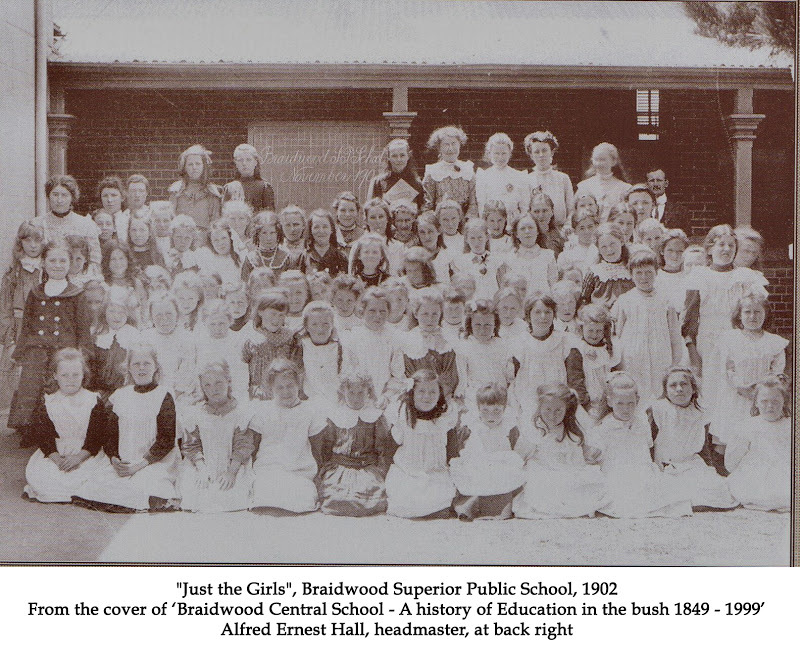 An influenza outbreak hit Braidwood and resulted in the death of her sister Harriet from pneumonia. Harriet was only 15 years old at the time of her death in October, 1905 (BMD, NSW, Ref 12031). Her mother looked to the church for both financial and emotional support and this was provided by the minister, Reverend Ellis, and his wife from St Andrews at Braidwood. Although a newspaper article seeking donations for the family is difficult to explain: “the mother being a widow with six children and only two of whom are old enough to do anything for themselves” (The Braidwood Dispatch and Mining Journal, Wednesday 4 October 1905) . At the time of Harriet’s death most of Sarah’s siblings were independent. Zenton was 28 years old and not living at home and soon to be married, Alexander was 23 years old working and was to marry three years later, Mabel was 21 years old and married seven years later so she was not infirm, Sarah was 18 years old and working in Sydney which left only Ruby dependent on her mother at 12 years of age. There is no record of how Sarah met her husband to be Frances Alfred Biggs. It is more than likely that as both the Biggs and Shepherd families had a close affiliation with the Church of England they may have met at one of the services or many functions organised by the church such as recitals, concerts, picnics or sporting events. What is known is that around April 1906 her relationship with Frances resulted in her becoming pregnant and in July it appears that they eloped and were married at the Methodist Parsonage at Lismore on 4 July, 1906.The witnesses at the wedding A Williamson and M Megley are not known in any other family records, nor is the minister who performed the service. Sarah, is recorded as being 21 years of age on the marriage certificate but she was only 19 years old, and by law was considered underage and required the written permission of her father or guardian to wed. This was to haunt her later in life and they would have undoubtedly have been told by both sides of the family that the marriage was void as permission had not been granted. Regardless of the validity of their marriage their first son, Francis Alfred, was born on 2 February, 1907, and they had moved to 9 Derwent Street, Glebe. It is unlikely that Sarah would have been welcomed into the family not only because of the irregularity of their marriage but also because of the huge disparity between the Shepherd and Biggs families both from an economic and social status viewpoint. Despite this Francis and Sarah remained in Sydney and one year later on 7 February 1908 their second son, Stephen was born at 42 Swanson Street, Erskineville. 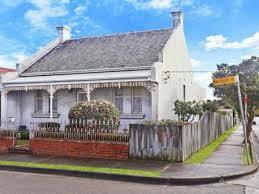 Current photo of 42 Swanson Street, Erskineville, little changed from when Sarah and her family lived there. Whether it was due to their alienation from the Biggs family or whether they were seeking more opportunities Sarah and Francis then moved to Manilla in western New South Wales. Francis’ sister, Jessie, had married Joseph Wearne, a successful business man in the region, and it may have seemed to offer better opportunities than remaining in Sydney. Francis was working as a grocer and Sarah was left to care for the two boys, isolated and separated from family and friends, and pregnant with their third child. The loneliness of life in the bush was exacerbated by severe floods in the area in January 1910 when she was six months pregnant. On 24 April 1910 she had their third son, Ernest Roy, at Bayley Park via Boggabri. It is not surprising that their time at Boggabri was short lived and records show they had moved back to Sydney just two years later. The family’s return to Sydney is confirmed by two items in the newspapers in 1912. A Mr F A Biggs (tenor) was advertised as soloist at the Burwood Congregational Church and Mrs F A Biggs was included in the list of names on the social page attending the 20th Annual Masonic Lodge Ball at George Hall Newtown in July 1912. Both her mother in law and father in law died in 1912. Only one of her husband’s ten siblings had married. 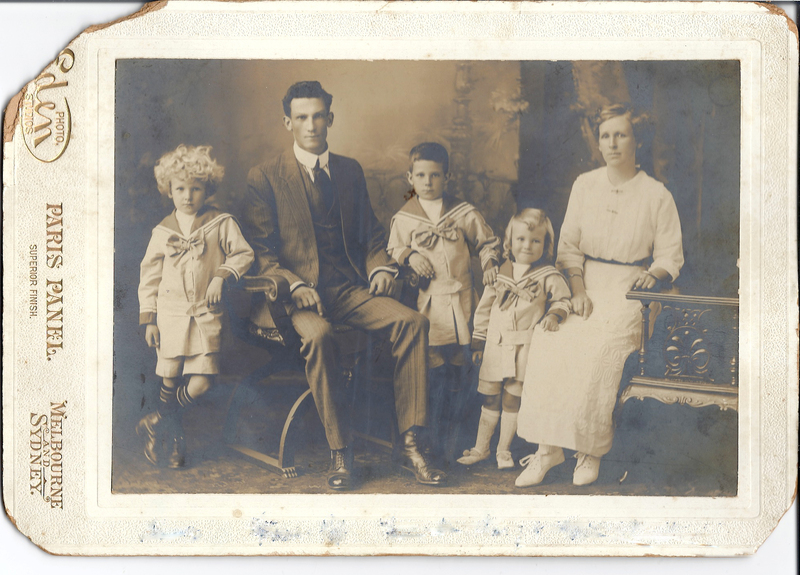 Her sister in law, Jessie, was living in rural New South Wales and it is hoped that with their move back to Sydney, the nearness of their son Francis and his three grandsons may have softened their feelings towards him and their daughter in law. 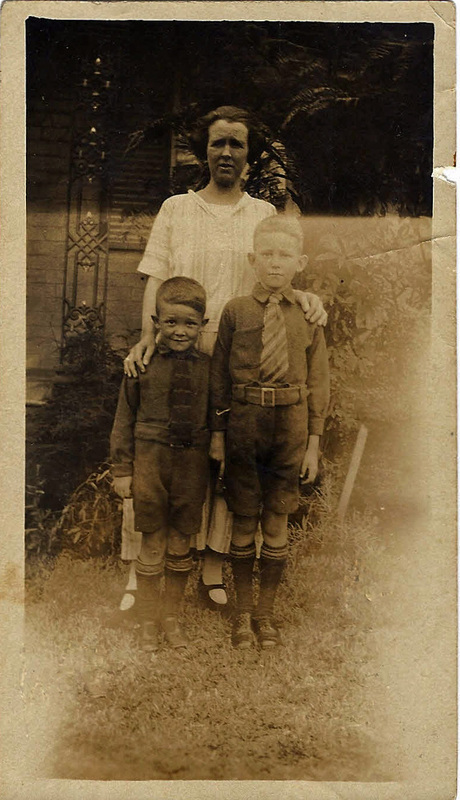 This photo taken around 1914 show the three boys, Stephen next to his father, Frank (Francis Alfred) in the middle and Roy (Ernest Roy) next to his mother. The dress gives some clue as to their status and affluence. The boys immaculately dressed in sailor suits, long socks, good leather shoes, with the two younger boys not yet school age retaining their curls and long hair, and only Frank having a cut which indicated he was now a young man and attending school. Both parents are well dressed and Sarah’s outfit is in tune with the latest fashion of a straighter, lighter line that was more natural than the heavily corseted outfits of the Edwardian era. There is a significant gap of almost five years, before the next record is found that sheds some light on the family’s movements. Their next son, Godfrey Charles Biggs (known as Charles) was born on 17 February 1916 at St Marys. In talking about his life, Charles talked of being born a twin with the other infant, a girl, dying shortly after birth. There is no record of the death of this child and due to privacy laws it is too difficult to access Charles birth record until the 100 year time limit is reached, so in under two years when the records become available it may further inform the family’s history. There is then another significant gap until their son Frederick is born at Croydon on 20 October 1919. Having lost a father and sister to pneumonia, Sarah would also have been horrified at the outbreak of pneumonic influenza in Sydney in January 1919. Everyone in Sydney was required to wear a mask. No one was allowed on a tram without one. The epidemic raged for over six months and heavily pregnant with her fifth child, Frederick, Sarah would undoubtedly have been concerned for the welfare of herself and her family. By the time of Frederick’s birth on 20 October 1919 the family appear to have settled into life at Croydon. The first World War did not appear to have a major impact on their life, Francis was working as a grocer to support his family and his sons were too young to enlist. Croydon, like most inner city suburbs had a retail and trade bias and they would have adapted to a comfortable life within this setting. In 1920 the Sands Street Directory shows them living at 2 Macgregor Street, Croydon. Current photo of a house from the 1920s in Macgregor Street. Croydon. No 2 Macgregor Street, Croydon has substantially changed but this photo is indicative of a similar house in that street during the period of their residence. With a new baby and four boys under 12 years of age Sarah would have had to work hard to care for her family. There would have been little help from her husband. Working as a grocer, he would have been away from home for long hours from Monday to Saturday with only Sunday as a “day of rest”. There were no labour-saving devices like vacuum cleaners and electric irons which were not developed until the 1920s. Everything had to be cleaned and scrubbed regularly, lamp glasses were cleaned with newspaper and the fuel stove cleaned with black lead, all the clothes were boiled in the copper which was lit with the use of bellows and floors and steps were scrubbed on hands and knees with whiting and sandsoap. This was along with the usual domestic tasks of cooking, ironing, sewing and of course child care. Her sons were growing into respectable, good looking young men. They received a basic but sound education at Croydon Public School to Intermediate Certificate level. The Church also played an important part in the life of the Biggs family. Like most families of that era Sunday would have been spent very quietly with often two or three trips in the day to Sunday School, fellowship and church services. Church picnics and musical events were special occasions and the sons played with the sporting teams organised by the Congregational Church at Croydon. 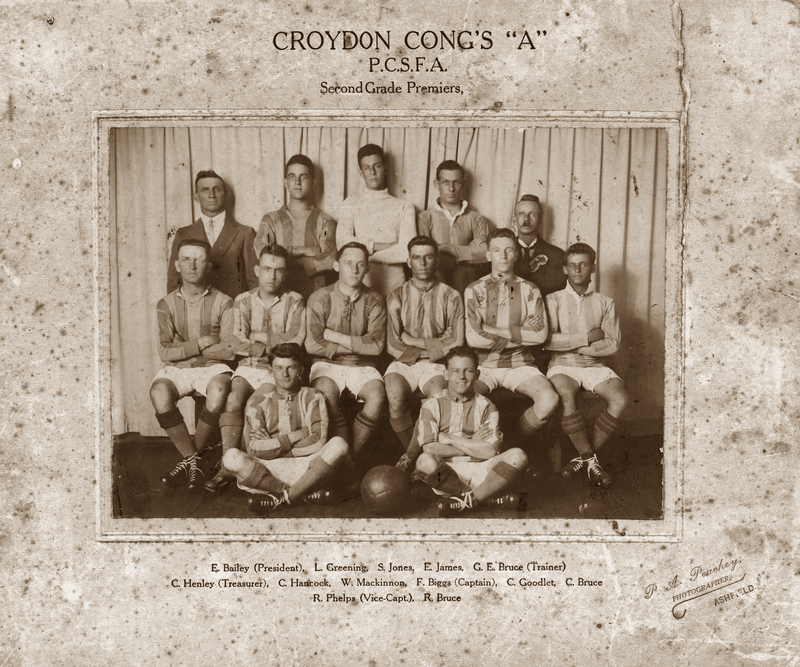 An undated photo shows Frank junior (probably around 20 years of age) as captain of the Croydon Congs Football (Soccer) team having won the second grade premiership. Without modern technology, families needed to make their own entertainment. Her husband and sons all had good singing voices. 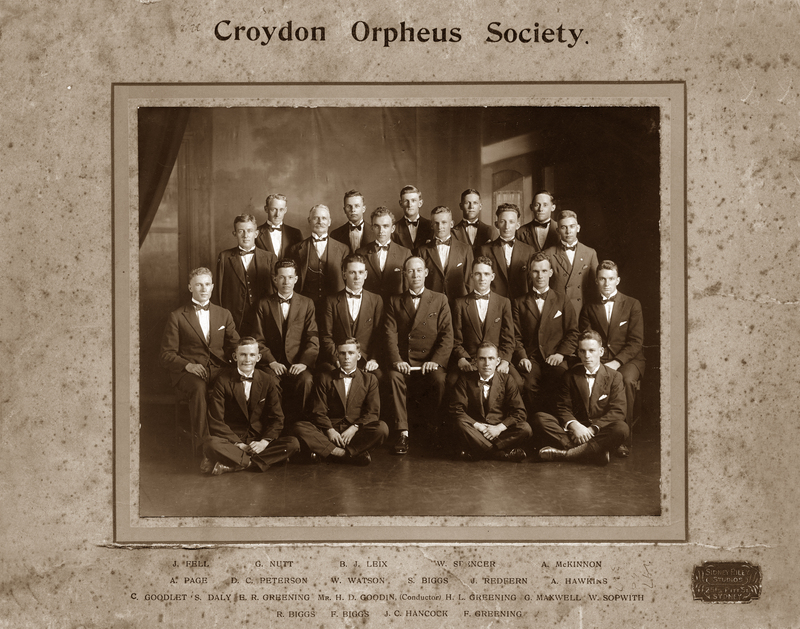 Frank, Stephen and Roy joined choirs, both the Croydon Orpheus Society and the Metropolitan Orpheus Male Choir. Charles remembers his mother loving music and dancing and it was not surprising that Charles developed a talent for ballroom dancing. To all intents their life appeared to be happy. However, death continued to haunt the family. In April, 1925 her sister in law, Maritana Kenton, wife of her half brother, Zenas, died. A year later her 13 year old nephew and brother’s youngest son, Alexander died. But even closer to her heart would have been the death of her older sister Mabel from pneumonia on 26 May 1928. In early January 1929 Sarah started to show signs of having a breakdown. According to her medical records she was restless, agitated, worried about people following her, hearing voices and had gone “to Grace Bros and bought all sort of thing”. She had not only spent all the money she had but had also “booked up another 25 pounds of goods she did not have any need for” with her only explanation that the voices she was hearing told her to do it. Her mental state must have been both confusing and shocking for her husband and he arranged for her to see their local doctor and he referred her to Callan Park Mental Hospital at Rozelle on 10 January 1929. Sarah was 42 years old. Her husband, Francis, had little alternative but to sign the papers requesting her admission. 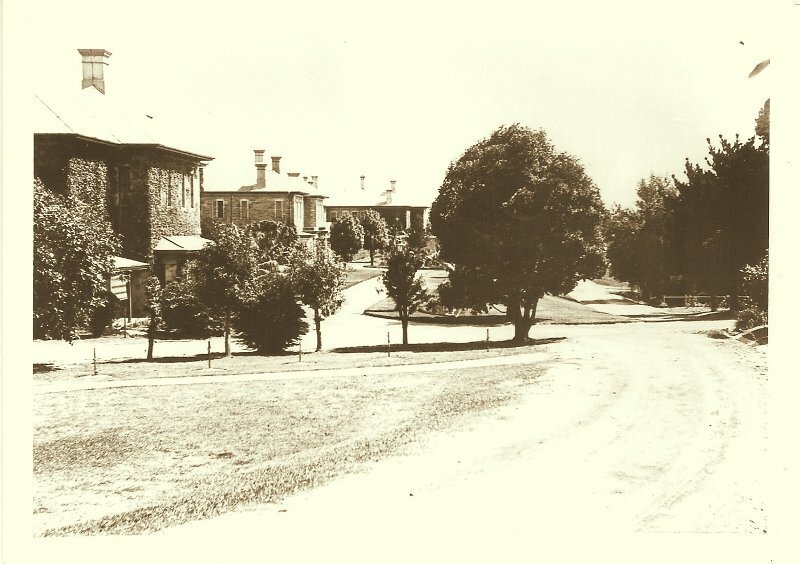 Callan Park Asylum 1930. Situated on the banks of Iron Cove,Callan Park was officially opened in 1884 and continued to operate until it was amalgamated with Broughton Hall to form Rozelle Hospital in 1976. Source: State Library of NSW. On admission she was in a restless and agitated state, hearing voices, confused and depressed. At the end of the month medical records show that she was improved although a letter from the Medical Superintendent states that she was still depressed and mentally confused. As the family was anxious to take her home they allowed her to return to her family on 8 February 1929. Her condition had deteriorated by August and she again required readmission this time for a much longer duration. Her medical records illustrate not only her condition but the effects of the heavy sedation she was given: “she always seems depressed – stands about the courtyard in an apathetic fashion”. It was over four years before she was allowed home on leave again on the 28 April 1934. Unfortunately the period of leave was short lived with a catastrophic end to her time at home. Initially she settled at home but her delusions returned. Thinking herself a respectable single woman being held against her will in a household of men she violently attacked her husband, son and the housekeeper with a knife leaving her family no option but to have her recommitted on 30 May 1934. The family was fractured and damaged by the experience of her mental breakdown and along with the attitude of society to mental illness it is little wonder that they rarely spoke of their wife/mother. The family still continued to visit her every week even though she still refused to acknowledge any relationship with them. Her own family, mother, brother, sister and niece also visited her regularly during the 1930s. In January 1937, her sister, Ruby, applied for and was granted release of Sarah into her care for a twelve month trial period in the hope that living in a household with women from her family would help her settle. The asylum authorities were required by law to monitor trial absences, however, her medical records do not detail this release, apart from a signature on her medical records noting that she was returned to Callan Park for a regular review of the family situation and of her condition. Despite extending the period of “leave” she was readmitted to Callan Park in January 1939, her medical notes showing she was not ‘recovered’, ‘continued to hear voices’and was ‘difficult to manage’. As there was no known cure for schschizophrenia she received the standard treatment of sedation to control her agitation and depression. Monitoring of her condition was little more than custodial with an annual medical examination and a very brief note in her file recording a doctor’s visit every three or four months. Sarah’s life revolved around the institution, there is no mention in medical notes of the impact on her of the death of her brother and mother in 1940, nor of the start of World War Two and the death of her son Ernest Roy on a bombing mission during the war, nor the death of her husband in 1959. It could be assumed that she was either unaware of these events or could not understand the relevance to her life. Life in such an institution was not good. Callan Park was overcrowded, in 1954 records show that there were 1,182 males and 691 females patients. Her sleeping accommodation was in a dormitory with patients expected to retire promptly after an early supper. There was inadequate heating and bathrooms were substandard and unsatisfactory. Her meals were eaten in a group dining room and the food service was reported as unsatisfactory, with poor quality, monotonous meals served that fell far short of modern dietary standards. Sarah was very upset by these condition and in particular her clothing. Her clothes had been replaced with standard issue institutional garments similar to a prison. Patients were not permitted to keep their own clothing and even if supplied the clothing “disappeared” due to theft either by other patients or staff. “The clothes I have hardly anything to wear. I am very poorly clad” Sarah writing to the medical superintendent in October 1934. Activities for female patients were limited to routine tasks such as sewing, cleaning and doing the laundry. These tasks were also considered part of their treatment and patients received no payment for this work. From 1939 Sarah worked in the laundry and this appears to have been her constant “employment” for the remainder of her time at Callan Park. A number of reports concerning Callan Park and the treatment of the mentally ill were written between 1931 and 1961. All of the reports painted a depressing and dingy picture of the institution and conditions that would create a sense of helplessness and desolation that could only cause the patients’ condition to deteriorate and turn them into chronic patients. 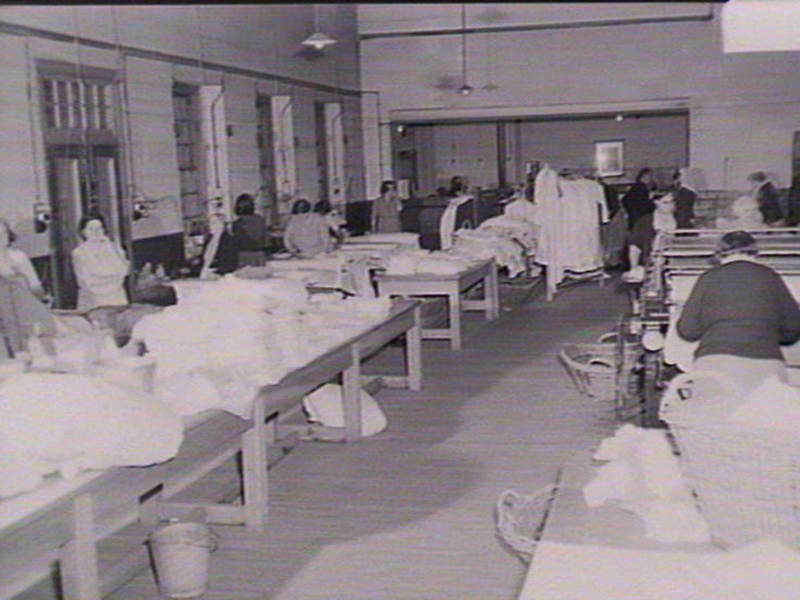 A Public Service Board Inquiry was conducted into the Callan Park Mental Hospital in July 1948, to investigate allegations made in the Sun newspaper, on the state of disrepair of the buildings; the inadequacy of food in quality and quantity; insufficiency of clothing for patients; misuse of patient labour and lack of or improper treatment of patients. The report admitted shortage of staff and difficulties of staff recruitment, especially nurses, but made no specific proposals to overcome these defects. It dismissed allegations of poor food, unsatisfactory clothing and staff cruelty to patients. The report was superficial in its investigations and its recommendations. The term ‘whitewashing’ may be too harsh to describe the exercise but it was definitely little more than a political exercise to quieten public and political criticism of the institution. 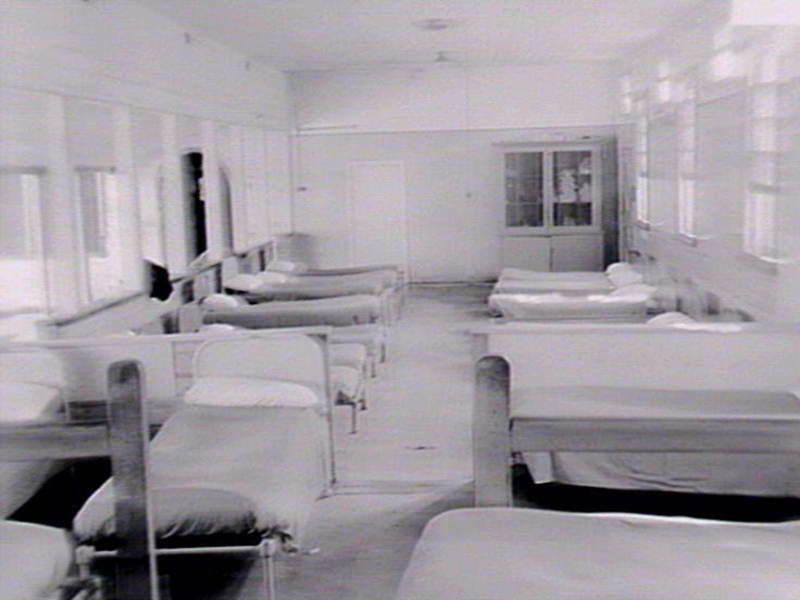 Due to an ongoing campaign by the Sydney Morning Herald and reports of the atrocious conditions experienced by the patients eventually a Royal Commission of Inquiry to investigate charges against the operation of Callan Park was held in 1961. It found overcrowding of the hospital to be the major problem, preventing proper administration and impeding therapy. (Royal Commission of Inquiry into the Callan Park Mental Hospital in 1961). Despite visiting an asylum being a heartbreaking experience, her husband and sons continued to visit her almost every week and letters written by her husband show his continuing and unfailing concern for her welfare and his hope that she was receiving the best of care. By the mid 1950’s, with the discovery of drugs that transformed the treatment of mental illness Sarah’s condition improved and she recovered some of the awareness of her husband and family. The family did consider if it was possible for her to be released into their care in the 1950s but Sarah continued to be rambling and mildly demented as well being too institutionalized by that time to be considered for release. She continued to receive visits from her husband until his admission to a nursing home and his death on 29th May 1959. Her sons were also regular visitors. Charlie’s daughter, Margaret, recalls a visit to Callan Park in the 1950’s to visit her grandmother. What triggered her breakdown is unclear. There is no direct genetic/hereditary history of mental illness in the Shepherd family line that lived in Australia so it is most likely that her early environment as well as psychological and social factors were the contributory factors to her condition. It is not difficult to understand this occurring when considering her history. Having been brought up in poverty, with the early death of her father, two of her sisters, the loss of at least one baby following childbirth and other close relatives would all be substantial ‘triggers’. Added to these factors was the ever constant worry that her marriage was not valid, highlighted in her medical records, and showing her concern about her marital status and the legitimacy of her children. All factors that would have contributed to her breakdown. Her death was peaceful. On the 19th February, 1962 she told nursing staff that she was not feeling well and was going to lie down. When she was checked on later she had suffered a stroke (cerebral haemorrhage) and died. Sarah was 75 years of age. She was cremated at Rookwood Crematorium on 21 February 1962. Although she may rarely have been talked of by the family she was undoubtedly dearly loved by her husband and sons until the end and her legacy has been the five wonderful sons that she raised and their families. Note: This was an extremely difficult part of our family history to write. It affected me deeply and I have tried not to allow my feelings to influence the facts of Sarah’s story too greatly. As well as information from family, many of the details on Sarah’s life come from medical records held by NSW State Records and accessed by authorisation from NSW Health. I have also undertaken considerable reading and research into psychiatric care and Callan Park to provide more background on the last thirty years of her life.